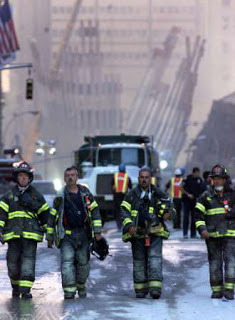 I was at work in the emergency department on 9/11/2001. When the first plane crashed into the tower, we were all dumbfounded and sad, but when the second plane hit the other tower, the chill of intentional horror hit us. Then the Pentagon took a hit from another plane followed by the plane in Pennsylvania thwarted from its suspected target of the White House by the brave passengers on board, we all knew the ugly truth. We experienced terrorism on a level never experienced before. I called my niece and nephew just because I suddenly knew how important family was. The need to reach out to them was imperative in a world suddenly uncertain. We prepared as best we could at work for the possibility that Charlotte might be next. Who knew what would happen next. A torrent of emotions ran through the department from anger to weeping. No one smiled. It was so odd and somewhat eerie to drive home with a clear blue sky above and not a single plane anywhere—not even a small Cessna. Nothing existed except this feeling of unbearable loss and mourning. When I reached home, I saw for the first time on TV the towers crumbling to the earth and the people posting pictures of their lost loved ones who were in the towers hoping against all odds they would be found alive. In the weeks that followed, I felt I was living through one funeral after another. The sadness was overwhelming. In the midst of all this turmoil, I adopted a kitten who had been hit by a car in front of the veterinary hospital. They saved her, fixed her injuries and had the kitten in the lobby. I took my dog, Kate, in for her shots and saw the black and white kitten crying in her cage. They named her Liberty. She was a beacon of light in a gloomy period of history. Liberty. Something innocent and sweet calling out to me. I took her home with me that day and she has brought me endless happiness ever since. I kept the name they gave her. I couldn’t think of another name that could possibly mean more to me than Liberty. My cat, my country, the ideal of our founding fathers. Liberty.